We are active in the tire recycling market, and accept used automobile and truck tires at two of our nine Houston area recycling center locations. The majority of discarded tires we collect are eventually recycled as an alternative fuel source. This type of fuel has more BTUs, is cheaper, and burns cleaner than coal. Discarded tires have been a disposal problem and continue to accumulate throughout the world today. Some experts estimate that Houston citizens discard as many as six to seven million tires each year. Each year in the U.S., more than 279 million discarded tires are added to an estimated 2 billion tires already stockpiled throughout the country. Stockpiled tires create fire hazards and also provide breeding sites for disease spreading mosquitoes. 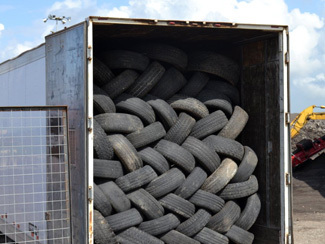 Recycling discarded tires can minimize their environmental impact and save valuable landfill space.